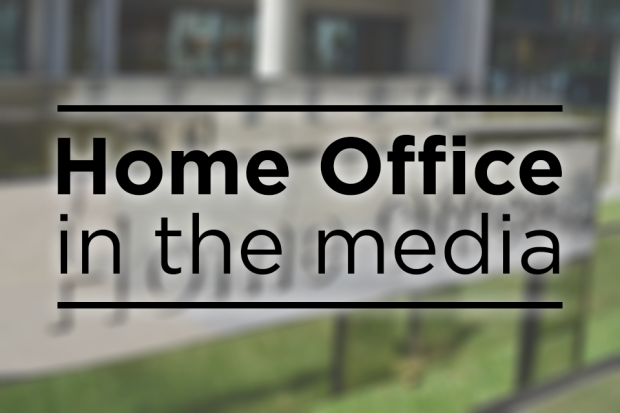 Today's Home Office-related news includes comments from the National Police Chiefs’ Council on indecent images. The lead on child protection at the National Police Chiefs’ Council, Chief Constable Simon Bailey, has given interviews to the Times, BBC and Sky News on the “unprecedented volume of non-recent abuse, ongoing abuse, online abuse, peer-to-peer abuse”. It came as Crimewatch aired a programme focused on child abuse. The Home Office has issued a statement underlining that this Government is doing more than any other to tackle child sexual exploitation. Downloading and viewing child abuse images is a terrible crime and should be treated as such. We have committed £20 million to the National Crime Agency for specialist teams to tackle online child sexual exploitation. Alongside ensuring we have a tough law enforcement response to bring offenders to justice, we are also committed to preventing offending in the first place. The UK has some of the most robust legislation in the world to combat online child sexual exploitation. Section 160 of the Criminal Justice Act 1988 prohibits the possession of an indecent photograph or pseudo photograph of anyone under 18. Such offences carry a maximum sentence of 5 years’ imprisonment. The Government strengthened the law in 2009 by legislating that virtual depictions of children are also against the law. It is an offence to enter into a sexual communication with a child. We brought Section 67 of the Serious Crime Act into force on 3 April this year to ensure the robust protection of children online. The Government has prioritised child sexual abuse as a national policing threat and funded expert police analysts and coordinators in every region. The licence to practise for police officers, announced in November 2016, will ensure that only suitably qualified officers lead on child sexual abuse investigations. Our response includes law enforcement agencies taking action against online offenders; developing new capabilities to find and safeguard victims and working with the internet industry to remove illegal images. We provided an additional £10 million in funding for NCA CEOP command in 2015/16, which has led to a near doubling of its investigative capability. We have provided an additional £20m for the remainder of the current spending review period to help sustain this capability. £20 million from the Police Transformation Fund has recently been provided to the Regional Organised Crime Units (ROCUs) to significantly increase the undercover online (UCOL) capability which is being used to target online grooming of children. Through the WePROTECT Global Alliance, we are leading the international response to eradicate online child sexual exploitation, bringing together governments, law enforcement, industry and civil society to galvanise global action to tackle a global problem. Industry has committed to taking steps to increase the number of hashes or ‘digital fingerprints’ of known child sexual abuse imagery, to prevent their distribution, and to collaborating to develop new technologies to respond to the problem. In 2014, companies including Facebook, Google, Microsoft, Yahoo, Adobe and Twitter signed up to statements of action, and committed to sharing hashes or ‘digital fingerprints’ of known indecent imagery of children to ensure their rapid removal. They also committed to further innovation to help improve the detection and removal of images and videos of child sexual abuse. In 2014 we agreed that the Internet Watch Foundation (IWF) could take on a proactive role looking for indecent imagery of children in circulation in 2014. In its first full year of this activity, the reports the IWF processed increased to 112,975, a rise of 52% on the previous year. Its 2016 report was launched on 3 April, and showed that 52% of content hosted in the UK is removed within sixty minutes or less of the IWF reporting it to their members. In its annual report, published in April 2017, the IWF found that the UK hosts just 0.1% of identified child abuse URLs. In February 2017 the Government published its Tackling Child Sexual Exploitation Progress Report, which gives an update on action the government is taking to deal with child sexual exploitation. This isn't a blog - it's a summary of news coverage and a reputation of Home Office press statements - dull and uninteresting. Based on your own description this is only written for journalists, which misses the point of social media. The Home Office has some fascinating functions (Border Force, Immigration Enforcement etc) - why not have frontline officers and leaders blog about their working lives. It would be much more compelling.